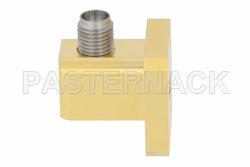 PE-W28CA001 WR-28 waveguide to coax adapter is also known as a WR-28 waveguide transition. This waveguide to coax adapter / transition is constructed as a WR-28 to 2.92mm connector and has a female gender. Our WR 28 to 2.92mm female waveguide adapter transition has a right angle design and has a square cover flange. Pasternack right angle WR28 to 2.92mm waveguide to coaxial cable transition / adapter has a minimum frequency of 26.5 GHz and a maximum frequency of 40 GHz. 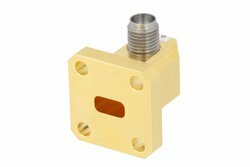 WR-28 waveguide to 2.92mm transition adapter to coax PE-W28CA001 is part of over 40,000 RF, microwave and millimeter wave components available from Pasternack. Our WR-28 waveguide adapter transition with 2.92mm interface can ship worldwide the same day that it is purchased as with our other available RF parts.